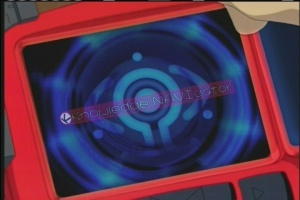 The Knowledge Navigator or NAVI for short are high-powered computers designed around accessing The Wired with ease. While some aren't pretty to look at they are unmistakably powerful. NAVIs can come in almost any shape or form. Of the more common NAVIs, the first is the Child's NAVI. It is distinguished by it's bright red shell and space saving design. It's primary purpose is to familiarize children of all ages with the computer so that they won't have to learn how to use one later in life. This gives companies the added bonus of not having to train their employees on how to operate a Navigator. The second is the common desktop model of the Knowledge Navigator. The computer is a single unit with a monitor built into the front of the box. While it's not as pretty or as space efficient as the Child's NAVI it is the most powerful consumer model on the market. Once assembled the NAVI is ready to connect to the Wired right out of the box. An added bonus to NAVIs are that, while you can use the keyboard and the mouse to maneuver within their OS, voice recognition and speech synthesis software comes preloaded to allow comfortable computer use... this feature is also included in the children's version of the NAVI. Their power is greatly enhanced by a Psyche chip's access to Protocol Seven. They use the Copland OS. The third NAVI is a group of NAVIs in handheld form, or HandiNAVI. Most handheld NAVIs are designed with kids in mind, although adults use them as well. The first in this group is a rectangular model with the same bright red shell as the Child's NAVIs. It's under the hood power is comparable to a Child's NAVI but replaces the keyboard, and speech software with a stylus. It's primary function is an e-mail and chat device which includes live two-way audio transmission. The second handheld is almost identical to the previously described but has a different user interface replacing the stylus with a 'remote controlled car' style device and the small touch screen with VR glasses. The remaining handhelds are simply variants or customized models of the above two. Lastly, while pre-packaged NAVIs and handhelds are the most commonly used NAVIs, geeks and tech gurus enjoy building their own by themselves. Separate components can be purchased and assembled to create a NAVI that fits a given person's lifestyle or interest. While this is the preferred method of computer to those who are seriously delved into the arts of technology most homebrewed systems are not as powerful as their pre-packaged counterparts. This is because NAVIs that are pre-assembled are tweaked at the factory to provide maximum performance. It would take an absolute genius in the field of NAVI technology, and an enormous amount of money, to custom build a system that would out perform a top of the line consumer NAVI. Under the hood hardware wise are the basics of any household computer. All high end NAVIs are designed to allow incredible amounts of upgrades and enhancements to the existing machine. This allows NAVIs to have longer lives preventing people from having to buy new ones every few years. This page was last edited on 20 April 2014, at 08:36.